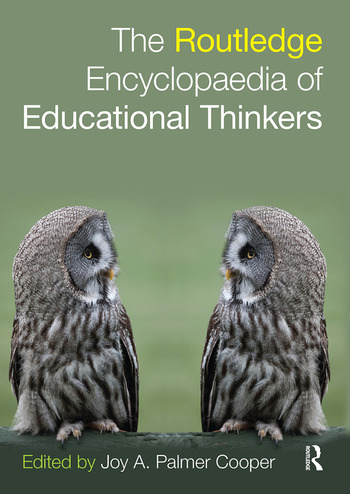 The Routledge Encyclopaedia of Educational Thinkers comprises 128 essays by leading scholars analysing the most important, influential, innovative and interesting thinkers on education of all time. Each of the chronologically arranged entries explores why a particular thinker is significant for those who study education and explores the social, historical and political contexts in which the thinker worked. Carefully brought together to present a balance of gender and geographical contexts as well as areas of thought and work in the broad field of education, this substantial volume provides a unique history and overview of figures who have shaped education and educational thinking throughout the world. Combining and building upon two internationally renowned volumes, this collection is deliberately broad in scope, crossing centuries, boundaries and disciplines. The Encyclopaedia therefore provides a perfect introduction to the huge range and diversity of educational thought. Offering an accessible means of understanding the emergence and development of what is currently seen in the classroom, this Encyclopaedia is an invaluable reference guide for all students of education, including undergraduates and post-graduates in education or teacher training and students of related disciplines. Joy A. Palmer Cooper was Professor of Education in the School of Education at Durham University and formerly Pro-Vice-Chancellor of Durham University. At present she is Chairman of the Charity Project Sri Lanka and Vice-President of the National Association for Environmental Education.